After waiting 108 years for a championship, Cubs fans are getting much more from their team these days, especially when it comes to technology upgrades at Wrigley Field. 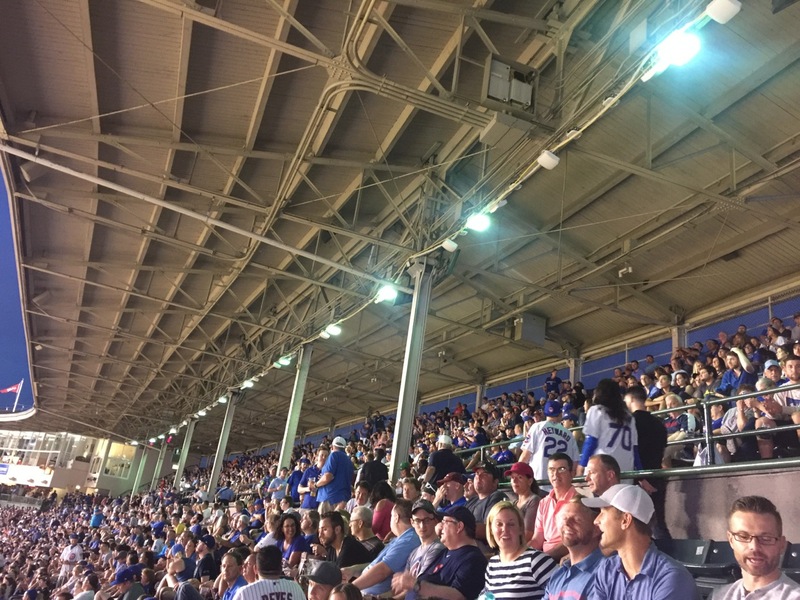 Recent years have seen a complete renovation of the venerable bleachers, including big video screens in both left and right field, as well as a full-stadium distributed antenna system (DAS) for enhanced celluar connectivity that went live at the start of this year. 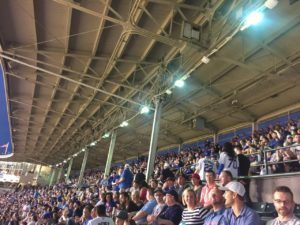 And while the Cubs were eliminated from the playoffs this week in a Wild Card loss to the Colorado Rockies, the Cubs in the offseason will continue this summer’s process of adding Wi-Fi everywhere they can inside the Friendly Confines, after more planned offseason stadium construction will force the club to move some equipment installed earlier this year. While some Wi-Fi APs were live in the upper deck seating section as well as mounted on overhangs covering the stadium’s terrace-level seats this season, a planned installation of under-seat Wi-Fi AP locations is currently on hold, as the Cubs continue to evaluate how best to proceed for some of the tougher-to-cover seating areas. Wi-Fi coverage is already operative, however, for back-of-house operations, as well as in fan-facing areas on the outdoor Gallagher Plaza and the Zachary Hotel next door. Editor’s note: This profile is from our latest STADIUM TECH REPORT, an in-depth look at successful deployments of stadium technology. Included with this report is a profile of Wi-Fi at Nebraska’s Memorial Stadium, a sneak peek at Milwaukee’s new Fiserv Forum, and a profile of the new DAS at StubHub Center! DOWNLOAD YOUR FREE COPY now! 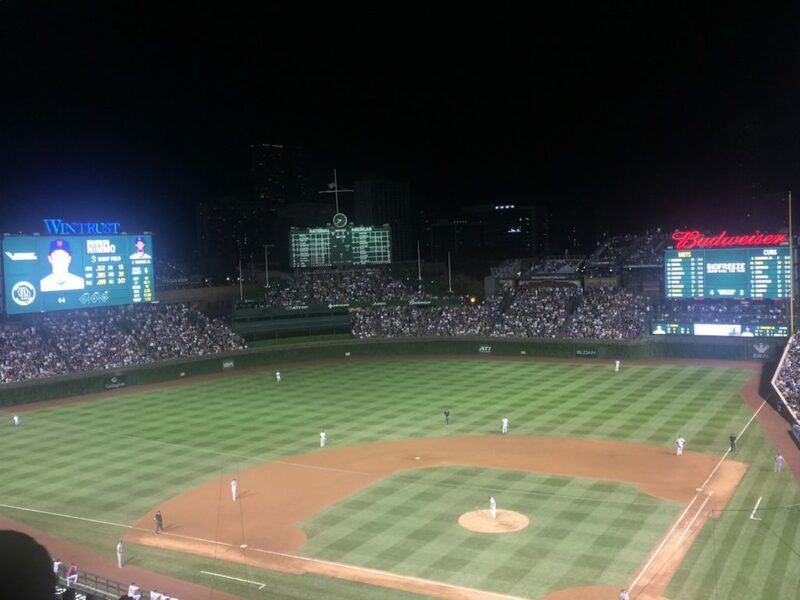 First announced in 2015, the plan to bring both DAS and Wi-Fi to Wrigley has been challenged almost since its inception by the team’s ambitious plan to renovate many parts of a stadium that was originally constructed in 1914. The multi-phase physical construction project included the bleacher expansion, the creation of a hotel, office building and park on the stadium’s west side, new club spaces and (still to come) expanded suites and an upper-deck concourse. Of course the entire plan got immediately sidetracked by the team’s historic run to the 2016 World Series title. While having construction delayed by winning your first crown in over 100 years is not a bad problem to have, the team’s string of extended seasons (the Cubs have made it to the NLCS the past three years, meaning baseball deep into October) has played continual havoc with the renovation plans, since winter in Chicago isn’t often friendly to construction activities. Originally scheduled to appear in 2017, the DAS wasn’t built until this past offseason, and even though it is running well now (our most recent visit saw speedtests in many locations well into the 20+ Mbps range for both download and upload) a good portion of the DAS antennas will also have to be relocated this offseason because of more construction plans. The Wi-Fi network, which the Cubs are building with gear from Extreme Networks, felt even more of the pain from this past year’s main construction project, which saw the entire lower bowl of Wrigley get removed so crews could dig about 60 feet deep to build under-stand club areas, one of which opened for this season. Those clubs, including more that are scheduled to open for the 2019 season, sit directly below the seating area that was scheduled to get under-seat Wi-Fi deployments, further complicating and delaying the installation. For the lower main seating bowl and for the bleachers, the problem for Wi-Fi in those seating areas is the complete lack of overhead structures, or of any aisles with railings, to mount antennas. While DAS antennas are able to cover those regions from above and behind, a good Wi-Fi design would need an under-seat deployment, which is what the Cubs and Extreme had planned for. Andrew McIntyre, vice president of technology for the Chicago Cubs, talked with MSR during a late-August visit and said that while he thinks the club will eventually have to do some amount of under-seat antenna locations — if not for Wi-Fi, then eventually for 5G cellular support — the plan from earlier this year to put Wi-Fi under-seat during this summer is shelved for the time being. “We just have to make sure the structural integrity [of the lower seating slab] is not challenged,” said McIntyre. 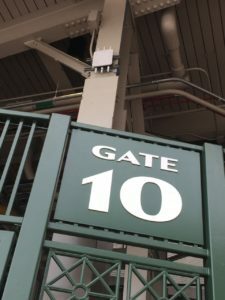 Since a good part of any under-seat Wi-Fi deployment in the lower bowl would require work above the club-space ceilings, it would take extra time that’s simply not available between baseball games and other events like concerts. 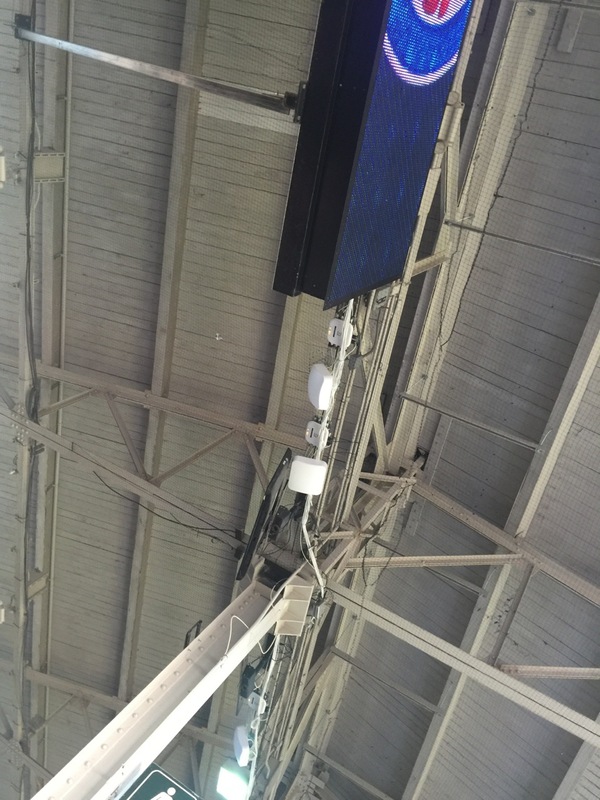 In the upper deck seating sections at Wrigley there are no such impediments to Wi-Fi AP location, with many easy mounting points up in the roof infrastructure. With a wide concourse in the middle of the upper and lower sections, many APs required only a scissor lift for installation, McIntyre said. The easily viewable APs have their accompanying antennas tilted either forward or backward to cover the two separate seating sections. Even though McIntyre and the Cubs are purposely throttling the unannounced Wi-Fi network’s speeds to a top mark of around 7.5 Mbps for both download and upload until the network is complete, MSR was able to get strong Wi-Fi responses everywhere we walked in the upper deck, as well as in the lower terrace seating areas, which are below the upper deck sections. On the terrace level there are basically three rows of DAS and Wi-Fi gear, one in the back along the rear concourse, one in the middle of the roof to cover most of the seating and another out at the edge toward the field, to cover seats below there. Unfortunately, many of the devices in this area for both networks will need to be removed and replaced this upcoming offseason when the final phase of Wrigley’s renovation will see the premium suite areas extended further back, which will require construction work on their floors, where the antennas are currently mounted. Like any networking pro, McIntyre would prefer to see his projects completed as thought out, but he is also a realist who knows that trying to do anything architecturally inside a beloved historical icon will eventually involve tradeoffs. Take the center part of the right-field bleachers, which right now is somewhat less covered by the DAS simply because there’s no place on the back wall to mount antennas. Since anything placed there would be in view of passers-by on Sheffield Avenue, McIntyre said due to historic-building regulations the Cubs would need to ask for permission to build any new structures. “It’s a never-ending challenge, and we fight as hard as we can [to get technology deployed],” McIntyre said. On the topic of incomplete Wi-Fi coverage, he noted that the DAS was designed to cover “100 percent” of fan connectivity needs, with the Wi-Fi being a complementary service. At the very least, the new network means that more fans will have an easier time connecting in whatever way they need to, while enjoying baseball at one of the world’s most beloved venues. “In the end, it’s all about delivering the best possible experience for fans,” said McIntyre.